Comic books out loud, fer cryin' out loud! 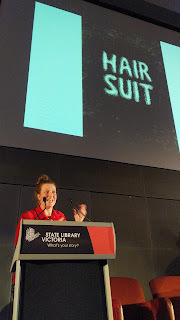 So: on the evening of Saturday the 5th of May (World Cartoonists Day, if you don't mind), there was a performance at the State Library of Victoria called 'Read to Me: comic book stories performed live'. 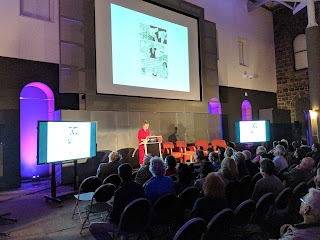 That title is pretty descriptive: a quill of cartoonists turned up and read their works out loud to an audience of about 120 breathless punters. Above, Sarah Firth embarks on the reading out of her hilarious autobiographical story, 'Hair Suit'. 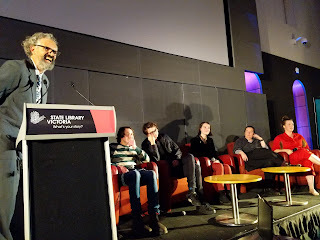 Here you can see that we were reading the stories in the State Library's 'Experimedia' space. Who's 'we', you say? 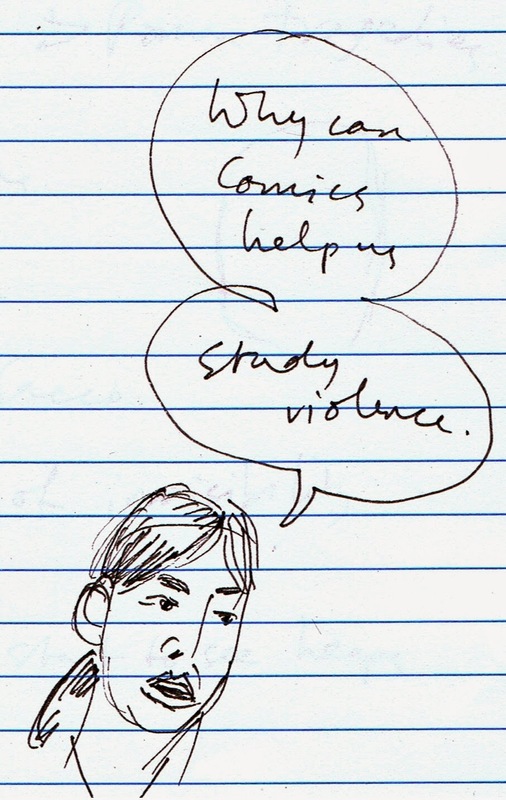 Well, go to the Read to Me concept originators' site, here, to see the list of comic book readers on the night, and also to see the staggeringly talented Fionn McCabe's portraits of us all. Also, check out when the next 'Read to Me' event is going to take place. And GO! 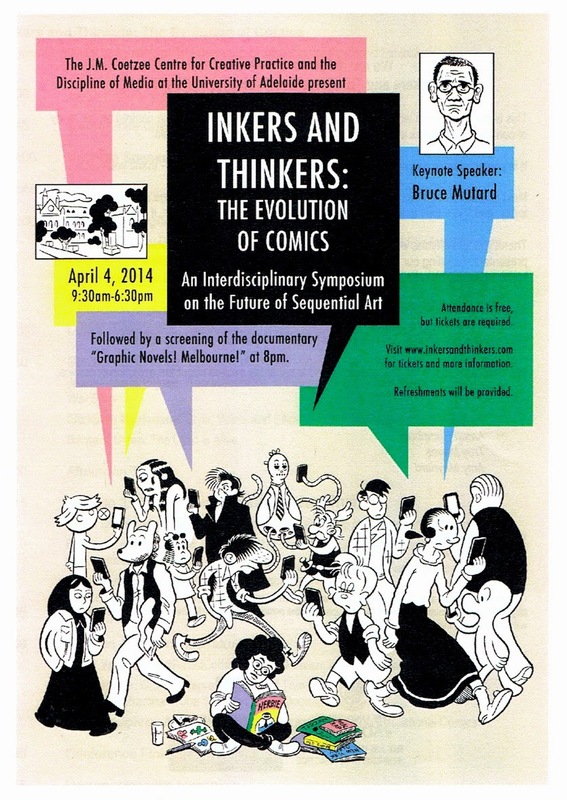 This is the future of comics performance, after all. Oh, you didn't know that was a thing? Well, it is. Gabriel Clark and Fionn McCabe say so. And here we all are: Bernard Caleo, Andrew Weldon, Chris Gooch, Ele Jenkins, Jo Waite, and the aforesaid Sarah Firth. We are q'ing a's at the end-of-night Q & A. After which, we bundled off to the traditional post-comics event feast location, Gaylords, for pappadams, wine, and laffs. 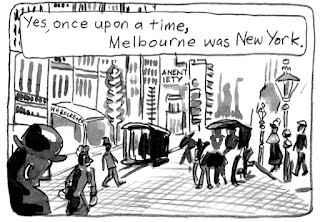 I was pretty darn excited that night, because I read out the public debut of the 'trailer' for The Devil Collects, an graphic novel set in 1880s Melbourne, which shows and tells the decline and fall of the richest city in the world at that time: Marvellous Melbourne. The Devil Collects is made by me and historian Alex McDermott. 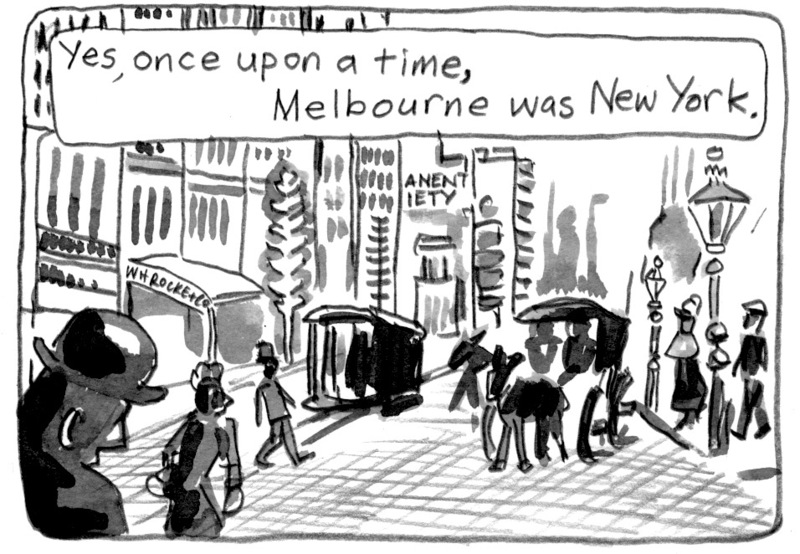 Yes, last Saturday night, Melbourne WAS New York. 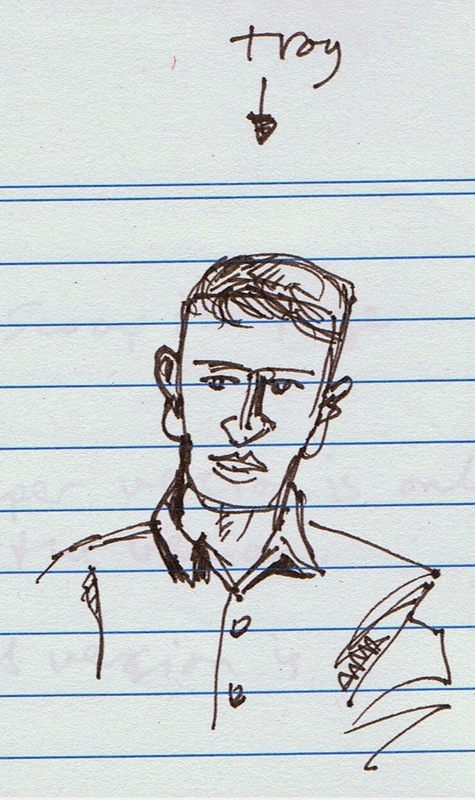 All photos taken by Jason Leong: thanks, Jason! Earlier this year, 2018, I was working on a three-page comic strip story for Medecins Sans Frontieres/ Doctors Without Borders, the people who do remarkable work saving lives in under-resourced places in the world. The strip is set in a refugee camp in South Sudan and in the story there's a briefing that takes place, so said the script, 'in an open-air tukul'. Uh, where? 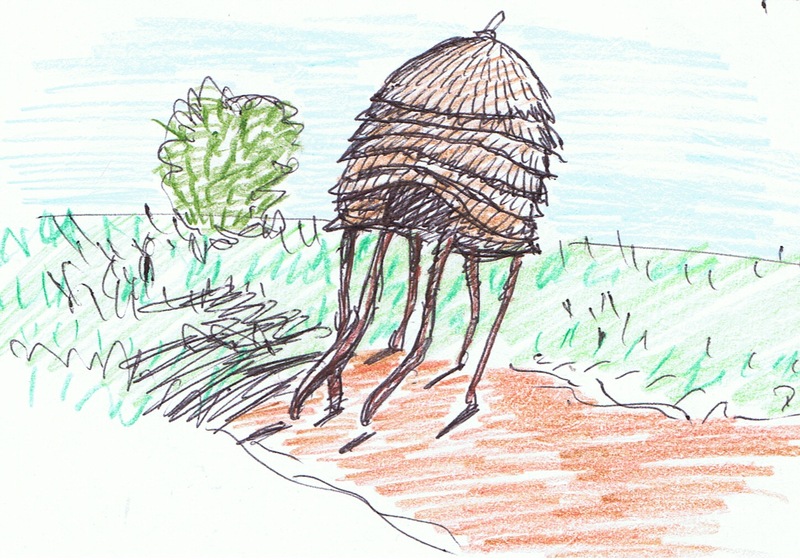 "A cone-shaped mud hut, usually with a thatched roof, found in eastern and northeastern Africa"
So I tinkered about with drawing one, transcribing it from an image I found in my photo file (often referred to as 'the internment'. Perhaps you've heard of it). 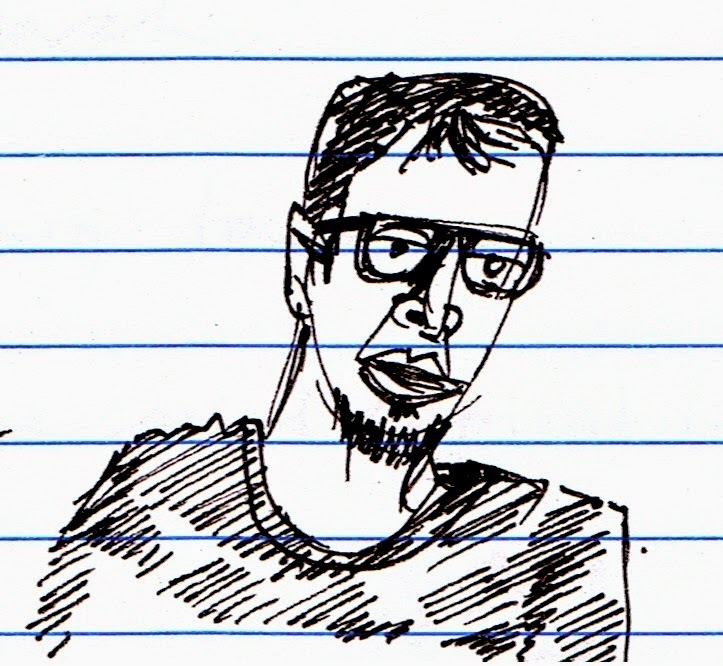 And, as so often happens with drawings, I found that I had made something into quite another thing. Or, more precisely, you've put a spin on it, created a version that on one day you might think of as an 'interpretation' and on another, as a 'mistake'. 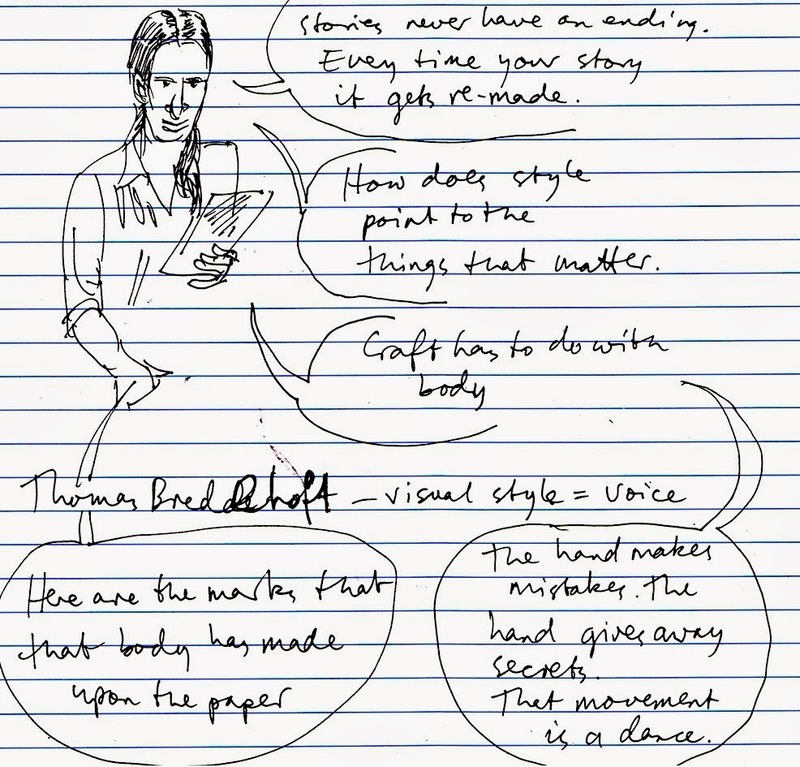 But when one writes with pictures, it's the former day you most want to wake up on. We're in the discovery business here, my friends. And that tukul is WALKING. 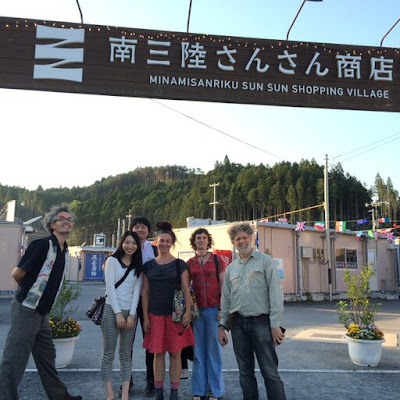 Here we are, freshly arrived in Minamisanriku on Sunday 24 May 2015. Behind us is the town's temporary town centre: shops and restaurants in portable units. 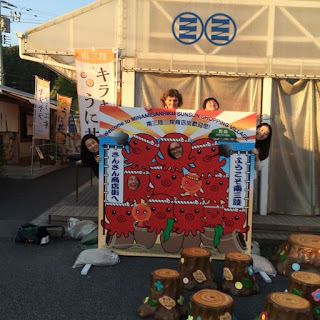 And here we are with our heads in the Octopus-kun, symbol of Minamisanriku. Or maybe mascot. This time you can also see Mikako-san on the left. 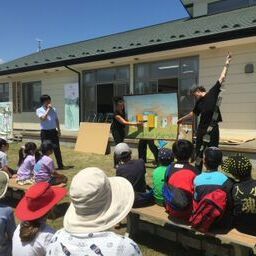 There's us performing the show, a 'mega kamishibai', at the Minamisanriku civic centre on Saturday 30 May, at a barbecue party supported by the Australian Embassy and other partners. 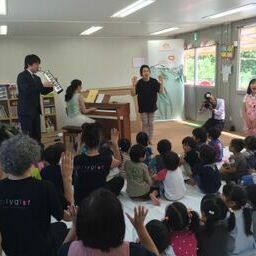 Here's Tomoya-san, Izumi-san and Mikako-san, the Asahi Cocchi team, playing music for the kids at the Asahi kindergarten to sing along to. This was the fourth kindergarten we visited last week. At each, we presented drawing activities, then some music and song, and finally a presentation of 'Momotaro: tsugi wa', the mega kamishibai. One of the great things was seeing the sets of kamishibai cards at the kindergartens (you can see the Asahi kindergarten's kamishibai library over my shoulder). Here, Mikako-san reads/performs a strange little story about Moomins (yes, Moomins) playing soccer with an alien and learning road safety lessons (this story was sponsored by Toyota). And here's us being rock stars. A great tour, a great experience. I'd love to return to Minamisanriku. What's next is that I am back in Japan. 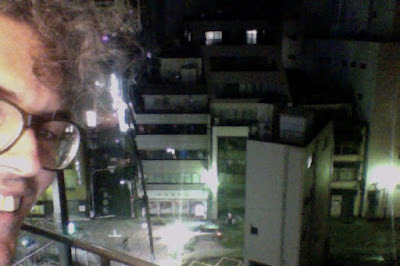 That's the view from the 8th floor of a hotel room in Ueno, Tokyo, taken last Saturday night the 23rd of May, after an izakaya dinner with my Polyglot colleagues, Stef and Dan. 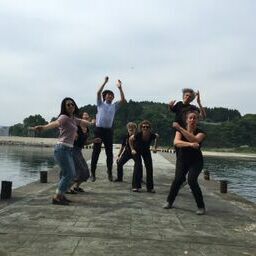 The next day we piled into a charcoal-coloured van with our fellow artists, Aachi Cocchi musicians Izumi-san and Tomoya-san, and the director of Aachi Cocchi, Mikako-san. Our tour manager, Lang Craighill, drove us north up the Tohoku Expressway to the town of Minamisanriku. Polyglot have visited this town twice before, the first time only months after it was ravaged by the March 2011 tsunami. This time we are working with residents of temporary housing, and then school children at the Iriya Elementary School, to produce a mega kamishibai which we will perform at Minamisanriku kindergartens next week. 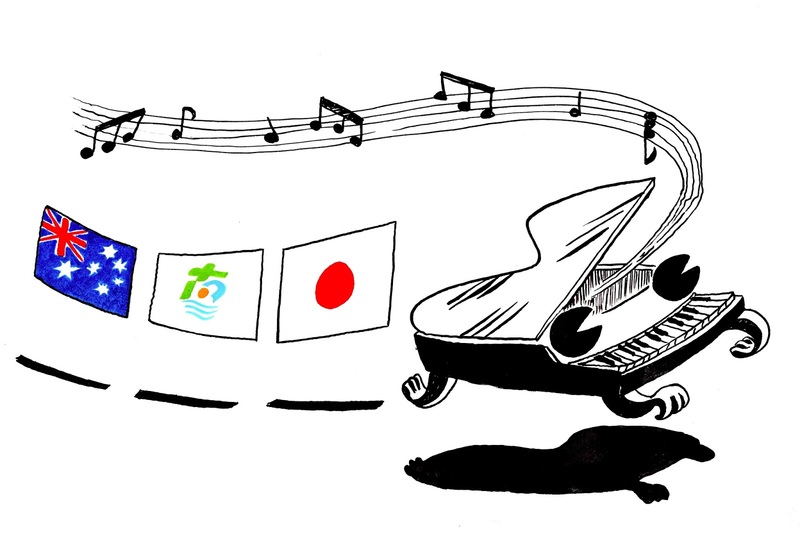 Aachi Cocchi (it means 'here and there') have been presenting classical music, opera and dance 'cafe concerts' in places affected by the tsunami since 2011 as well. As part of this two week program, called 'Drawbridge: Kids Are The Boss', Tomoya and Izumi have been playing Tchaichovsky, Rachmaninoff, Chopin, Piazzola and Disney for the residents and the students, and then providing live accompaniment for the kamishibai section. Here's Stef, Dan and I presenting a kamishibai introducing us, which I produced back in Melbourne. 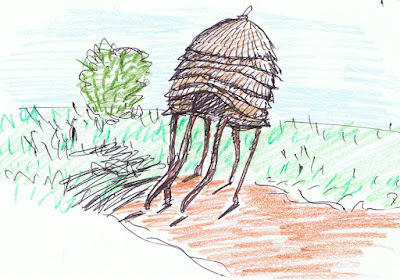 It was designed to introduce us and also to be able to performed to the chorus of 'Give Me a Home Among the Gum Trees'. There's Mikako-san translating for us, Izumi-san playing the piano, and Tomoya-san looking on. And here's the image I produced back in April so Mikako-san would have a picture to put onto the flyer advertising the cafe concerts for the temporary housing residents. The middle flag is the Minamisanriku flag. Last Friday night, the 19th of December, I was up in Canberra at the remarkable National Arboretum to perform 'Faraday's Candle', a 50-minute one-man show based on natural philosopher (scientist) Michael Faraday's 1848 Christmastime lectures, 'The Chemical History of a Candle'. This show was developed for Inspiring Australia, the national strategy for science engagement, and has been presented by CSIRO over the last three years in various venues: churches, cathedrals, conference centres, the theatre at Sovereign Hill, the Canberra science centre Questacon, and now the Arboretum. We've done short seasons and one-offs and last Friday was a one-off. 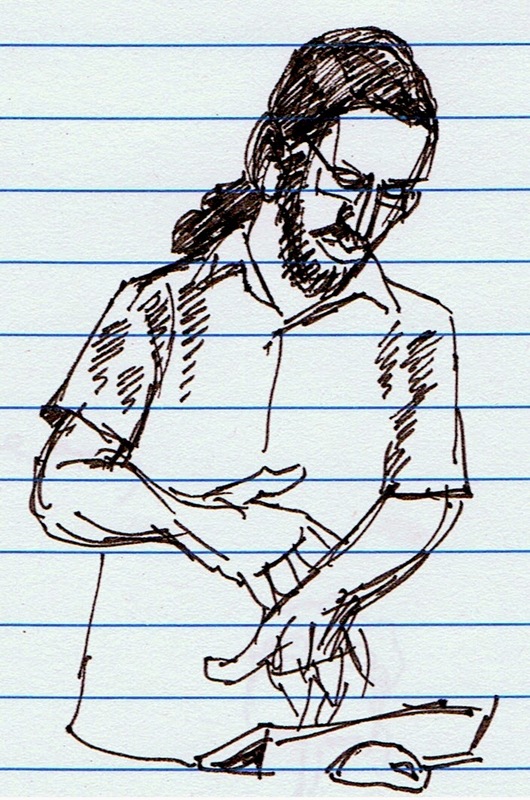 Below: me as Faraday drawing a diagram of a burning candle. 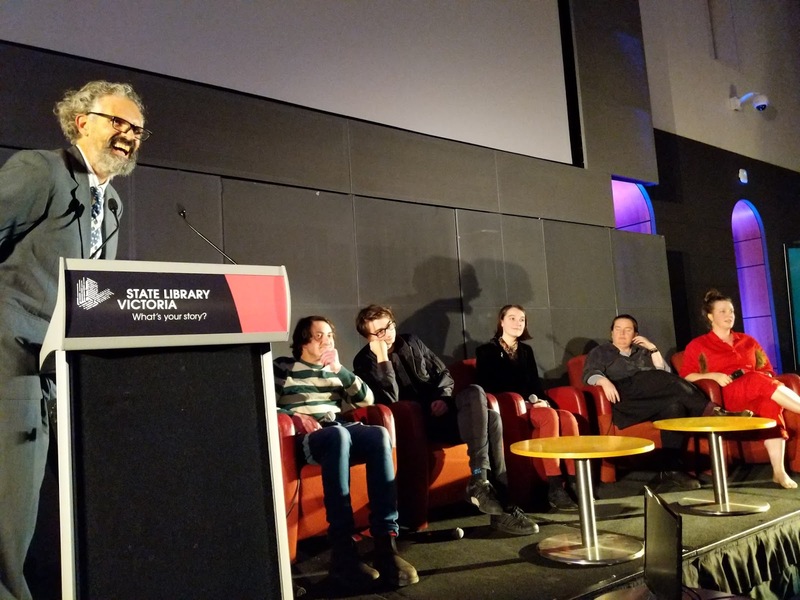 The team behind the show is: myself as writer/collaborator and actor; Carly Siebentritt (Inspiring Australia) as collaborator and producer, and Chris Krishna-Pillay (CSIRO) as collaborator and director. We had a lovely audience of 100 or so on Friday, including a man who had, years ago, borrowed a copy of Faraday's lectures from the ANU library and read them to his young daughter - and turned up to see our show with the very daughter! And... they liked it - phew! Above is some natty lighting by Chris: this is the point in the show where I become Sir Humphrey Davy, Faraday's mentor, the man who "...first described the light of the candle in terms of incandescent particles of solid carbon," as Faraday says in the script. To the left, the eponymous candle. To the right, Lake Burley Griffin. "All that remains at the end of this lecture is to express a wish that YOU may be fit to compare to a candle..."
Faraday's great because his influence on today's world is profound: his discovery of the generation of electricity by magnetic induction changed our relationship to nature irrevocably. But his dedication to education meant that he delivered these candle lectures again and again because they are a profoundly accessible introduction to fundamental ideas about fire, physics, and chemical reactions. And here we are, continuing his tradition. The trailer for the show (made by Chris) is on the Faradays Candle page. Carly took these pictures on Friday night. A tip of the fedora to them both: great people to work with.